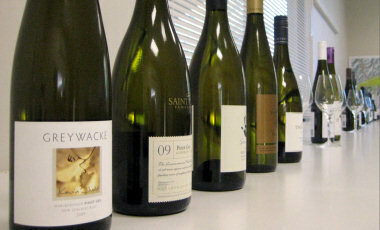 A broad cross-section of wines and styles was shown in this regional tasting, and the sheer number of oak-influenced Sauvignons and other grapes varieties compared to the “traditional” Marlborough Sauvignon styles shows the direction in which the industry is going. Some indicative prices and UK importers were given and these are quoted below, but there is also a wine-searcher link to stockists of the wines. Half of the Pinot Gris was in Burgundy bottles, half in Alsace-style flutes. Does that say something about a failure to yet identify a Marlborough style for the wine inside? Southern Valleys. 14.5%. Kevin Judd’s Pinot Gris has an attractively aromatic nose with a touch of dried apricot and a slight yeastiness, with a lime peel freshness and some spice too. The palate is just off dry, with lots of juicy, lemony, orange and citrus punch that really punches through to leave it dry and savoury, tangy and really appetising. 90/100. wine-searcher. Wairau Valley. 14.0%. Very fresh, with ripe apple and ripe pear aromas, a touch of creamy, richer character that is almost tropical. The palate is just off dry, with a deliciously full fruit, but a certain lift and lightness through the clear acidity. Deliciously tangy, lots of orange against the peachy sweetness. 90/100. wine-searcher. Regional . 14.5%. Biodynamic wine, whole bunch pressed and spending six months in French oak with battonage. Deep colour, rich, nutty nose, a touch of vanilla and a glimpse of bruised apple. The fruit comes through beautifully on the palate, with a lot of tropical, rich, vibrant fruit that has a sweet edge, but huge concentration too. The tang and decisive concentration of the finish means it needs food, but what a mouthful of wine. 91-92/100. £18.40 Armit. wine-searcher. Awatere. There’s a lovely pear fragrance to this: fresh pears, but also a hint of a pear tart, pastry note, with a lift of almost spearminty brightness. The palate is pretty dry and relatively lean compared to a wine like the Saint Clair, with shimmering acidity set against tropical fruit tones of guava and mango – a more obvious nod to Marlborough Sauvignon style, but has lovely weight and definition. 89-90/100. £9.99 Hatch Mansfield. wine-searcher. 13.5%. Less expressive than the Villa Maria aromatically, with apple and melon notes and a hint of something herbal. On the palate this is in the same, leaner style as the Villa Maria, with a scything cut of lemony acidity and plenty of mineral crunch to offset the mid-palate fruit sweetness. 90/100. wine-searcher. 14.%,. Quite rich, seems quite leesy and creamy with ripe pear and melon fruit and a slick of creaminess. The palate is quite full and rich, off-dry with lovely luscious fruit and great pear and apple pie ripeness and zest. There’s a spice and pepperiness too, as well as charming residual sweetness and good balance. 90/100. wine-searcher. Wairau Valley. 14%. Lovely Gewurz nose, with lots of lychee and spice and an expressive toastiness. The palate has luscious weight and is perhaps just off dry, with that full, sweet fruit set against nice acidity and a delicious, if relatively simple balance. A terrific, balanced, beautifully made wine. 89/100. wine-searcher. 13.5%. Wairau Valley. DIAM cork. Masses of spices and exotic fruits in an open and very expressive wine. Palate is medium-dry, with a beautifully composed palate of sweet, peach and exotic fruit and that terrific tension of that lime and mineral acidity that focuses this through into a very long finish. 91/100. wine-searcher. 13.5%. Gorgeous nose – bright and aromatic with a lovely but discreet floral lift and fine peppery and nectarine and tropical notes. The palate has lovely focus, the fruit very pure and fresh, notes of lime and peach combine to give a lush but fresh character and the finish has great brightness and food-friendly zest and zing. 92/100. £15. Adnams. wine-searcher. Southern Valleys. 14%. Vineyard planted after comparing the Waihopai and Kremstal regions according to the back label. Much leaner and more mineral than the Forrest, with lime and a certain peppery, spicy character coming through. The palate has an uncompromising dryness, with great verve and authority, the dry, herby, mineral finish long and savoury. I’d love to see how this develops over a few years. 89/100. £9.00 Bin Cellar. wine-searcher. 13.5%. Wairau Valley. Nicely aromatic and spicy, with some floral and peach down aromas joining spices and a touch of white pepper. There’s plenty of interest here, touching on an almost Sauvignon-like pungency. The palate has the same picture of juicy clarity and grapefruity punch of fruit and acidity, into a long, tangy finish. 91/100. £14.99, Liberty Wines. wine-searcher. Fabulously capsicum pepper nose, masses of spice and intense, sparky green herb and pepper qualities. The palate has a lovely salty minerality too that carries through with lots of sourness and savoury quality of preserved lemons and limes and a terrific sense of verve and precision. Slaty and stony, and has terrific clarity. 92/100. £15, Ellis of Richmond. wine-searcher. Nice pyrozene nose, with herbs and pepper and a lovely pungency. The palate has fine, racy fruit too and a delicious dryness, with a long, balanced finish and plenty of tang. 89-90/100. £11.99, Treasury Wine Estates. wine-searcher. 13.5%. Capsicum and leafy green herbs. A touch of gooseberry, and a fairly restrained, peppery style. The palate has a real leanness and savoury, dry, lemon and lime character, with terrific . Precision and length. There is roundness and weight here, but also a gorgeous core of finesse and minerality. 91/100. £16, Hallowed Ground. wine-searcher. 13%. Subdued spice and pepper nose, with some green bean and pepper, but all the fruit nicely focused and pure. The palate has a nice salty lick of minerality and that forma a nice, lean framework for the peachier, riper fruit to hang off of. A nice, well-tempered wine. 89/100. £11.99, Pernod Ricard UK. wine-searcher. 13%. Lifted, perfumed, slightly talcum nose with bright gooseberry fruit if a slightly tight impression as it hits the palate. Certainly more restrained and tight than some here, and that impression of tight, fine, focused mineral and lemon fruit drives this into a long, clear finish. 90/100. wine-searcher. Nice green fruit notes on the nose, with a limey freshness and touches of passionfruit and greengage in a typical but delightful Marlborough style. The palate has great zest and life too, lots of punch and thrust and a lean, taut sense of precision in the finish. Terrific stuff. 90/100. £7.99 – £9.99 D and D Wines. wine-searcher. Deliciously punchy stuff, with a touch of that sweaty character, but not too much as it has plenty of green, bright, herby aromas too and the palate displays masses of tropical fruit and richness, set against a big pithy core of lemon and grapefruit acidity. In many ways the most ‘typical’ so far of the classic Marlborough style, but extremely well done. 90/100. wine-searcher. A touch of the sweaty, elderflower nose here too with lots of lift and pungency, and deliciously tangy lime flavours. The palate has all the tang you could ask for, but also a clean, fresh, dry and savoury finish. 90/100. £13.99, Ellis of Richmond. wine-searcher. Flat and insipid with barely discernable fruit. Very poor, dilute and a travesty of the style. 79/100. £7.50, Patriarche Wine Agencies. wine-searcher. Nicely punchy, lots of verve though in the end a little bit too text book and safe. Balanced. 87/100. wine-searcher. Fairly discreet, but has lovely bright acidity on the palate with clear apple and tropical tones, though it is a perhaps a little too discreet for its own good? 88/100. £12, Bibendum Wines. wine-searcher. Fabulous smoky minerality, a lot of green bean and herby punch, very appealing. The palate has that ripeness and crunchy freshness, with delicious tang, real lime and grapefruit peel and zest and a long, shimmering finish. Deliciously moreish. 91/100. wine-searcher. Huge brazil nut French oak nose with masses of green fig and bold, tropical fruit. The palate has that huge presence too, the super-sweet fruit set against a decisive core of minerality, hints of coffee and charry oak just adding a supporting layer beneath. 93/100. wine-searcher. Full barrel fermented, wild yeast and lees-stirred recipe. More subtle oak than the Greywacke, with a lovely mealy richness and sense of precision to the wine – the oak definitely in the background. The palate has Graves-like poise and white fruit crispness, lovely length and a certain sense of minerality. 92/100. £29.95, Ellis of Richmond. wine-searcher. Fermented in French oak (70%) with wild yeast. Subtle mealiness to this, lovely sense of slightly herby, cabbagey, almost Burgundian aroma. That weird dislocation of place is somewhat dispelled on the palate, as this has the juicy verve of Sauvignon, with the green tones and pith acidity kicking in. Lovely stuff at a good price, and bone dry in the finish. 91/100. £12.99, Vintage Roots. wine-searcher. Wairau Valley. Complex, buttery, Brazil-nut nose with the ripe pineapple fruit beneath. Spearminty and bold. The palate has lots of verve and punch too, the minerality and taut, lemony acidity overpowering any more flamboyant tendency. A reserved, steely and decisive wine. 92/100. wine-searcher. Southern Valley. Natural cork. Lots of wild, yeasty, mineral and salty aromas. Ripe, slightly Burgundian character, with a certain vegetal character. Lovely Brazil nut oak and deliciously tangy, huge masses of lemon and orange fruit and acidity, but just tremendous length with such tang and life about it. 93/100. wine-searcher. Southern Valley. Fabulous cabbagey nose, with beautifully ripe tropical fruit powering through with huge ripeness. The wild, yeasty and creamy character set against the super sweet fruit on the palate and the huge, sour cherry and grapefruit acidity of the acidity powering through the finish. 92/100. £14.50 New Generation Wines. wine-searcher. Quite a deep buttercup colour. Nicely wild and herby nose with some nutty notes and an open sense of generous, creamy character but the fruit staying quite tight and focused. Lovely palate, the fruit very precise, very refined, the acidity just kicking through beautifully with that sweet fruit constrained by fine, lemon and mineral acidity. 91/100. wine-searcher. Regional. Very restrained and composed (very Burgundian) with a nice balance of minerality and ripe cabbagey aromatics showing herb-tinged melon fruit. The palate is wonderfully tight, balanced but also has that ripe apple and pear opulence, just wrapped in a tight minerality that gives this huge class and a long, orange and grapefruit tang in to the finish. Fabulous stuff. 92/100. wine-searcher. Awatere . Nice chardonnay, with an orangey and lightly nutty character, though it undoubtedly lacks the concentration and verve of the best here. Great balance, and the lemony acidity and lime of this really is very beautifully balanced and offers an intelligent, delicious mouthful of balanced chardonnay at a great price. 89/100. £7.99 – £9.99 D and D Wines. wine-searcher. Wairau Valley. Bright, focused, very lightly oaked wine with a decisive edge of acidity and bright fruit. Racy and fine, with lots of cutting edge, the acidity bright and focused and staying very refined and crunchy in the finish. 88/100. wine-searcher. Awatere. Delicious, stalky, beetrooty freshness. Lovely fresh, crunchy palate too with lots of berry sweetness but also has a real edge of acidity. 89/100. £10.99-£12.99 D and D Wines. wine-searcher. Regional Blend. Hugely leafy and fresh, with lots of earthy, mineral character and a delicious sense of earthy terroir. The palate has delicious ripeness and freshness, with a berry sweetness but also am undertow of mocha and fudge giving that lurking sense of depth and richness. 93/100. £23.95 Morgenrot in Manchester. wine-searcher. Well, no sign of ‘gum’ or eucalyptus which is a delight! Plenty of new oak here, with a shiny, ripe quality and a touch of coffee, lots of ripe berries and though it does not have the complexity of the Highfield, lovely wine. 90/100. wine-searcher. Mellow, creamy, but has a delicious berry richness and rounded, sweet fruit quality. The palate has gorgeous richness and creamy, rounded fruitiness too, with the acidity staying very tight and the tannins adding a lovely bit of grip. The finish is extremely long, and this has fabulous style and elegance. 93/100. £17 – £19 Must Wines. wine-searcher. Regional Blend . Tight, quite a lot of minerality, with a touch of mint and plenty of briary, full, ripe red berries. But this retains its freshness and its focus, with lovely balance and a cherry ripeness, the classy, fresh character pushing through into a long, long finish. Delicious and fresh. 91/100. £15.99 Hatch Mansfield. See all stockists on wine-searcher. I really enjoyed my visit to Framingham, not least because Gateshead-born winemaker Andrew Hedley (right) was so entertaining: an unreformed punk rocker, he launched his new ‘F-Series’ wines with posters that mimicked the iconic image from The Clash’s ‘White Riot’ tour from 1977, and his slogan is “No bullsh*t!” The Framingham story goes back to 1980. At that point the company was a grape grower, selling grapes to various well-known labels. In 1994 the first wine under the Framingham label appeared, appropriately enough a Riesling, the grape with which they have become most associated. By the end of the 1990s several other aromatic white wines joined the portfolio, and remain the main focus here. Whilst working in the Chemical industry as a scientist Andrew’s interest in wines developed, particularly German wines. At age 33 he decided to follow his passion for wine, and made his first stop the London International Wine Trade Fair where he pounded the aisles making contacts in the wine industry. New Zealand emerged as the place that interested him most “I managed to get the New Zealand newspapers delivered in Gateshead,” he tells me, “and kept my eyes open for work, eventually landing a lab manager’s job.” After several years Andrew made the transition into winemaking “without ever attending a wine making course.” He says that is something he is very happy with: “It avoids the ‘accept’ or ‘reject’ mentality,” he says, where wines can be seen in too simplistic black and white terms. 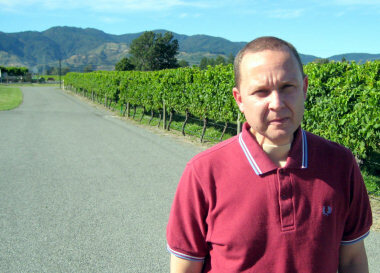 Andrew became senior winemaker at Framingham in 2002, though since then the company has changed hands a couple of times. It is now owned by the giant Portuguese wine group SOGRAPE. But Andrew says he has full autonomy in Framingham and has made many changes, including bringing in new styles of Riesling, getting rid of Cabernet and Merlot, and launching the innovate F-Series. “Riesling is still a tough, tough sell,” he says and despite the soaring reputation for Framingham’s Rieslings, they are a minority part of the business. But then he also says it is getting harder and harder to sell standard Sauvignon Blanc to sommeliers too: “The story is stale,” he concludes. A little bit of barrel ferment. Very bright, focused, limey and clean with sherbetty tones, with lots of really crisp, lemony fruit and a lovely crispness and focus. Has lovely dryness and mineral, river-stone freshness. Lots of punch and currant dryness. 90. £10.99. Selfridges own-label. Deliciously toasty and deep, with lots of passionfruit and herbs and intriguing layers of complexity with honeyed notes and a delicate nuttiness. The palate has pristine fruit and an orchard fruit clarity – very tangy, with marmalade tang and fresh citrus acidity, lots of acidity keeping this flowing and not cloying. 7.5%. 91. £12.99 per half. See all Framingham wines on wine-searcher. I met up with Jane Hunter in her low-key, relaxed restaurant (which serves terrific fish and chips) to taste through the Hunter’s range along with winemaker Inus van der Westhuizen and General Manager Peter Macdonald. Founded in 1979, Hunter’s is a very proudly family-owned and run company (Peter is Jane’s brother-in-law). Jane took over the helm when her husband Ernie died in a motor accident in 1986. 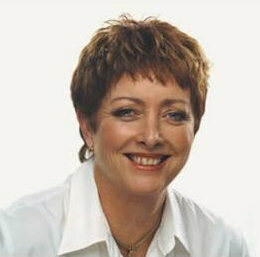 Today, Jane Hunter O.B.E. is one of New Zealand’s leading wine producers and ambassadors. Ernie Hunter was a true pioneer when he arrived from Ireland and planted Riesling, Gewürztraminer, Müller Thurgau, Cabernet Sauvignon, Chardonnay, Pinot Noir and, most significantly, Sauvignon Blanc in 1979. Today the vineyards have expanded to almost three times their original size and winemaking is shared between Gary Duke and Inus van der Westhuizen. Inus is bright-eyed, very focused young winemaker from South Africa, where he made wines at the excellent Cape Chamonix and spent five years working in the Pfalz area of Germany. His secret passion is for sparkling wine, which is a potential area for growth in the Hunter’s portfolio. This is a really good, solid range of wines at very affordable prices. It does not scale the heights of what Marlborough is doing, but delivers a lot of drinking enjoyment and bangs per buck. Champagne method made from 55% Chardonnay, 35% Pinot Noir, 10% Pinot Meunier. Lovely yeasty nose, with very fine baked apple aromas, lots of soft, rolling bubbles and very nice body and richness. Soft and attractive with lots of fruit and very good length. 89/100. £12.99, Laithwaites. Gently peachy fruit, good fruit with not much of the herbaceous fireworks character. The palate has very god acidity and lots of lemon zest elegance and freshness. Very good balance. 87-88/100. £10.99, Wine Society and Laithwaites. Barrel-fermented with some lees contact. Nice toffee, honeyed, edge, with, a sense of richness beneath the clean citrus and stone fruit flavours and aromas. Lots of zest and crunch and a really nice, racy finish. 89/100. Lovely stony and mineral nose, with lots of lime and lemon peel zestiness, gently aromatic with a touch of waxiness, then a mouth-watering lemony palate with huge length. 90/100. Nice beetrooty aromatics, lots of vegetal character and dry, cranberry and rhubarb fruit. Terrific fruit sweetness on the palate, with nice balance and delicious Good length and just enough earthy, briary oak coming through. Long and deliciously focused. 88/100. Lovely sense of creaminess and strawberry richness to this, a little more sweet fruit than the Stoneburn, and a little more coffeeish oak underpinning too. More extraction that the Stoneburn, but not at all over-extracted. Long, juicy finish with the creaminess of the tannins and a fine, tangy, long finish. 90/100. £12.00 Wine Society, Sunday Times Wine Club. More vegetal, warming, charming charry and earthy quality. Oak is savoury and coffeeish but has a lovely earthy darkness too. Has plenty of sweetness and an open-knit quality that is very attractive, soft and sweet, with lots of berry freshness. Tangy and orangy, with fine structure. 91/100. See all Hunter’s wines on wine-searcher. A terrific expression of Marlborough Sauvignon, with huge intensity on the nose and palate. Aromas of fresh cut limes and leafy green herbs precede a palate that is hugely concentrated, with a deal of mid-palate weight and texture, but the vibrantly expressive flavours powering through. Acidity is intense too, leaving this clean and dry and with real persistence. 90/100. Wild fermented with native years, 100% in barrel. Kevin says this one took a year to finish fermentation. Huge brazil nut French oak nose with masses of green fig and bold, tropical fruit. The palate has that huge presence too, the super-sweet fruit set against a decisive core of minerality, hints of coffee and charry oak just adding a supporting layer beneath. 93/100. With a modest 11.5% ABV this delicate Riesling from a single vineyard is made in a just off-dry style. It has a peach down softness on the nose, but a touch of flint too and a hint of sweet pepper. On the palate the teasing sweetness is scythed through by lemony, zesty fruit and acidity into a moderately long finish. 89/100. An attractively aromatic nose with a touch of dried apricot and a slight yeastiness, with a lime peel freshness and some spice too. The palate is just off dry, with lots of juicy, lemony, orange and citrus brightness that really punches through to leave it dry and savoury, tangy and really appetising. 90/100. Primarily from around Brancott, handpicked, sorted, partial whole bunch, wild yeast ferment and 100% new oak. Beautifully ripe and sweet, with density and chocolaty and coffee aromas, but not heavy or charry. Deliciously silky on the palate too, with long, sweet fruit and good acidity, tannins fine. 91/100. Made from fruit Kevin discovered hanging late in a vineyard he was driving past, this is only 12.5% ABV, and has 90g/l of residual sugar. Great smoky bacon glimpse on this, some lychee and grapefruity freshness too, but this is about spice and luscious apricot on the palate, a lovely mouth-feel and really fresh and orangy. 92/100. 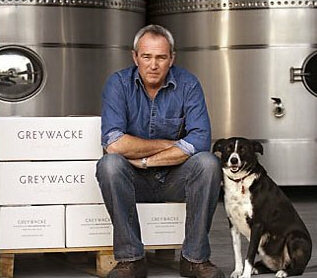 12.5% Greywacke is imported into the UK by Liberty. Launched in 2006, Tinpot Hut is the solo venture of winemaker Fiona Turner (right), who has collaborated for a number of years with winemaker Matt Thomson in the production of some of New Zealand’s most highly-regarded wines. The name Tinpot Hut is derived from the old sheep mustering huts in the remote hills between the Wairau and Awatere Valleys. 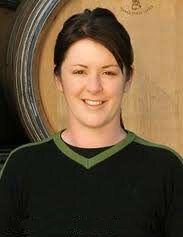 Fiona has worked in Marlborough, Hawkes Bay, Waipara, Central Otago and in the United States, and for Tinpot Hut she uses fruit from her own vineyards at Blind River in Marlborough’s Awatere Valley, but will continue to source from other regions to make the styles of line she likes: “I love Syrah from the Northern Rhône, so I look to Hawkes Bay for aromatics in the plum and spice spectrum.” she cites as one example. Currently the range comprises a Marlborough Sauvignon Blanc, Marlborough Pinot Gris, Marlborough Grüner Veltliner and a Hawkes Bay Syrah. “I try to make wines that I would like to drink,” she says, “so from Marlborough I’m aiming for a Sauvignon Blanc with a subtle Awatere Valley mineral influence.” The wines are already exported to the Europe, Australia, Hong Kong and Canada, but there’s a special UK connection (apart from the six months Fiona spent behind the counter in Oddbins in the 90s), as the company is jointly owned by Fiona Turner and Matt Thomson, in partnership with Liberty Wines UK, represented by David Gleave, M.W. From Awatere vines planted in 2006. Quite delicate nose, with stone fruit aromas and a touch of orange peel. The palate has an off-dry character, with a lovely lemon rind snap and good, dry apple fruit. Very nice balance with a little spice and phenolic grip in the finish. 89/100. A blend of Awatere (Blind River) and Wairau fruit from heavier silt soils. Very peppery and crunchy, with a touch of herby, soft green leaves and lemon grass. The palate broadens nicely, with a hint of juicy, almost tropical fruit on the mid-palate but then that searing core of mineral, dry acidity fine length and lots of finesse here. 91/100. From the Wairau Valley. Nicely aromatic and spicy, with some floral and peach down aromas joining spices and a touch of white pepper. There’s plenty of interest here, touching on an almost Sauvignon-like pungency. The palate has the same picture of juicy clarity and grapefruity punch of fruit and acidity, into a long, tangy finish. 91/100. Only 10% of this goes into new oak, from a single vineyard in Hawkes Bay. It has a lovely smoky bacon, game and cool climate herb and bloody nose. Very bold fruit. Delicious fruit sweetness, with a redcurranty, racy fruit quality. The wine has a beautifully silky mouth-feel and it finishes with length and harmony. A terrific Syrah. 92/100. 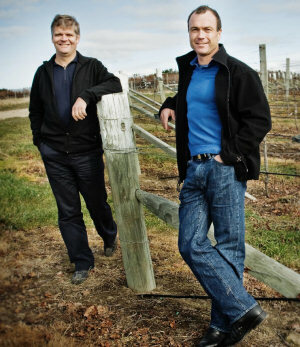 Like Tinpot Hut, Delta Vineyards is another joint partnership between winemaker Matt Thomson (right of picture) and David Gleave, M.W of Liberty Wines UK. Matt consults for Saint Clair, Mudhouse and other New Zealand wineries, but is also active in Italy making wine in Verona, Friuli and Piemonte. Matt and David Gleave met in Italy in 1994 (before Liberty wines was formed) but the idea for their project came to life when Matt found the Delta vineyard site in 2000. At that time it was operating as a sheep farm, but Matt planted it through 2001 and 2002, exclusively to Pinot Noir. Some Sauvignon Blanc is produced under the label, but from other vineyards. Around 45% of the Delta vineyard, which is on heavy clay soils, is on the ‘flats’ and is principally used for the Delta Vineyard Pinot label, whilst the ‘hills’ comprising 55% of the vineyard rises to 175 metres and is the main source for the Hatter’s Hill wine. Though their first releases were only in 2004, Delta Vineyards hit the ground running, their 2005 Pinot Noir winning both the Pinot Noir Trophy and the Champion Wine of Show at the 2006 Air New Zealand Wine Awards. “The combination of low vigour clay soils and the best of the new Dijon clones gives us superb fruit, some of the best Pinot I’ve ever worked with in Marlborough,” says Matt Thomson. Lovely delicate colour with a fine, sweet, soft strawberry aroma and an engaging touch of herbal quality and some briary, chocolaty notes. It has a fine palate too, plenty of lemony acidity and it has good finesse, the fruit having a keen raspberry edge and a long, pure finish. 90/100. This wine spends one year in bottle before release. It is a barrel selection from the 100% Dijon clone vineyard, some whole bunches go into the fermentation tank and the wine is aged in around 40% new oak. Beautiful Pinot Noir nose, with a nice open freshness, a touch of blueberry depth and gloss. Nice little floral note and hints of sweet strawberry fruit. The palate has delightful fruit and balance and a gently charry underpinning. 92/100. Delta Vineyards is imported into the UK by Liberty. See all wines on wine-searcher.